The total number of incidents involving incomplete inactivation—a process to destroy the hazardous effects of pathogens while retaining characteristics for future use—that occurred from 2003 through 2015 is unknown for several reasons. One key reason is that the Select Agent Program—operated by the Departments of Health and Human Services (HHS) and Agriculture (USDA) to oversee certain dangerous pathogens, known as select agents—does not require laboratories to identify such incidents on reporting forms. According to the program, 10 incidents occurred from 2003 through 2015. However, GAO identified an additional 11 incidents that the program did not initially identify. Because the program cannot easily identify incidents involving incomplete inactivation, it does not know the frequency or reason they occur, making it difficult to develop guidance to help mitigate future incidents. 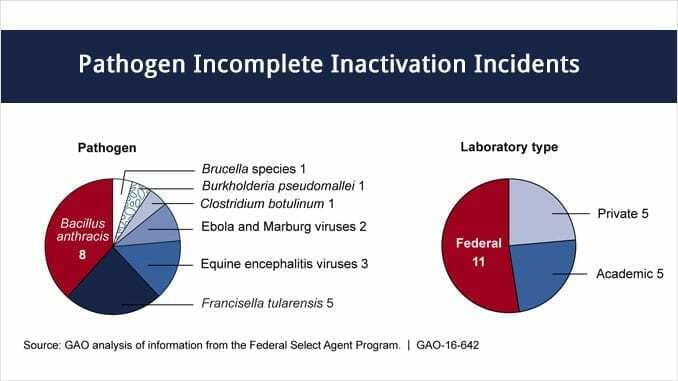 The 21 identified incidents involved a variety of pathogens and laboratories, as shown below. Several challenges affect the implementation of inactivation in high-containment laboratories, including gaps in scientific knowledge and limited guidance. For example, there is limited federal guidance for researchers on the development and validation of inactivation protocols. Validation helps ensure protocols are scientifically sound and produce consistent results. Due to limited guidance, laboratories varied in their interpretation of validated methods of inactivation, resulting in researchers applying differing levels of rigor. Without more comprehensive guidance, as called for by experts, protocols will vary in their scientific soundness, increasing the risk of incomplete inactivation. The Select Agent Program did not consistently refer incidents involving incomplete inactivation for further investigation and enforcement for violations of select agent regulations. For example, the program referred incidents involving incomplete inactivation at various laboratories, but did not refer two incidents in 2014 that occurred at HHS. A memorandum of understanding between HHS and USDA states that the program should handle incidents consistently. GAO found, however, that the program does not have a consistent, written set of criteria for handling incidents. Without such criteria, the program risks inconsistent enforcement of select agent regulations. This further highlights GAO’s previous finding that existing federal oversight of high-containment laboratories is fragmented and self-policing. Several incidents involving the shipment of live pathogens, thought to be inactivated, have recently occurred, potentially exposing people to dangerous pathogens that cause infectious diseases, such as the bacterium that causes anthrax. The extent to which incidents involving incomplete inactivation occurred from 2003 through 2015. Any challenges that may affect the implementation of inactivation in high-containment laboratories. The extent to which the Select Agent Program referred violations and enforced regulations related to incidents involving incomplete inactivation. GAO convened an expert meeting with the assistance of the National Academy of Sciences to discuss various issues surrounding inactivation. GAO also reviewed relevant laws, regulations, and guidance, and interviewed officials at laboratories that conduct inactivation. GAO is making six recommendations to HHS and USDA to, among other things, improve the Select Agent Program’s oversight of inactivation by revising reporting forms, improving guidance for development and validation of inactivation protocols, and developing consistent criteria for enforcement of incidents involving incomplete inactivation. HHS and USDA agreed with GAO’s recommendations. USDA should direct the Animal and Plant Health Inspection Service (APHIS) to develop clear definitions of inactivation that are consistent across the Select Agent Program. HHS should direct the CDC and NIH to develop clear definitions of inactivation for use within their respective guidance documents that are consistent across the Select Agent Program, NIH’s oversight of recombinant pathogens, and the Biosafety in Microbiological and Biomedical Laboratories manual. USDA should direct APHIS to revise reporting forms to help identify when incidents involving incomplete inactivation occur and analyze the information reported to help identify the causes of incomplete inactivation to mitigate the risk of future incidents. HHS should direct CDC and NIH to revise reporting forms within their respective areas of oversight to help identify when incidents involving incomplete inactivation occur and analyze the information reported to help identify the causes of incomplete inactivation to mitigate the risk of future incidents. HHS should coordinate research efforts and take actions to help close gaps in the science of inactivation and viability testing across high-containment laboratories. HHS and USDA should coordinate research efforts and take actions to help close gaps in the science of inactivation and viability testing across high-containment laboratories. HHS should direct CDC and NIH to create comprehensive and consistent guidance for the development, validation, and implementation of inactivation protocols–to include the application of safeguards–across the Select Agent Program, NIH’s oversight of recombinant pathogens, and the Biosafety in Microbiological and Biomedical Laboratories manual. HHS should direct the Directors of CDC and NIH, when updating the Biosafety in Microbiological and Biomedical Laboratories manual, to include guidance on documenting the shipment of inactivated material. GAO further recommended that consistent criteria and documentation requirements be developed for referring violations to investigative entities and enforcing regulations related to incidents involving incomplete pathogen inactivation. Read the full report: High Containment Laboratories – Improved Oversight of Dangerous Pathogens Needed to Mitigate Risk.